An emerging hallmark of cancer cells is their ability to hide from the body’s immune system. The human immune system is capable of destroying cancer cells; however, cancer cells find creative ways to ensure that the immune cells cannot find them, for example, by applying “brakes” on immune cells and disabling them. We have seen significant progress being made with tackling the “brakes” issue—by developing immune checkpoint inhibitors, a type of immunotherapy that takes off the brakes applied by cancer cells on immune cells. Recent studies show that cancer cells may also hide from the immune cells by “epigenetic silencing,” a process in which the expression of certain cell-surface molecules that are essential for the immune system to recognize and eliminate cancer cells is shut off. “DNA methylation” by Christoph Bock (Max Planck Institute for Informatics) is licensed under CC BY-SA 3.0 via Wikimedia. 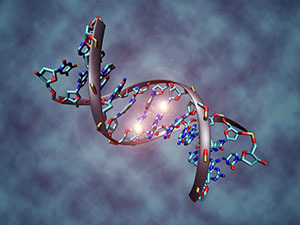 Epigenetic modifications are chemical modifications of the DNA (such as methylation and acetylation of DNA elements) that lead to alterations in gene expression. Therapies that target epigenetic regulators have improved the outcomes for some patients with hematological malignancies. In addition to their effectiveness as single agents, they have been successfully combined with chemotherapies because of their ability to sensitize cancer cells to chemotherapy. 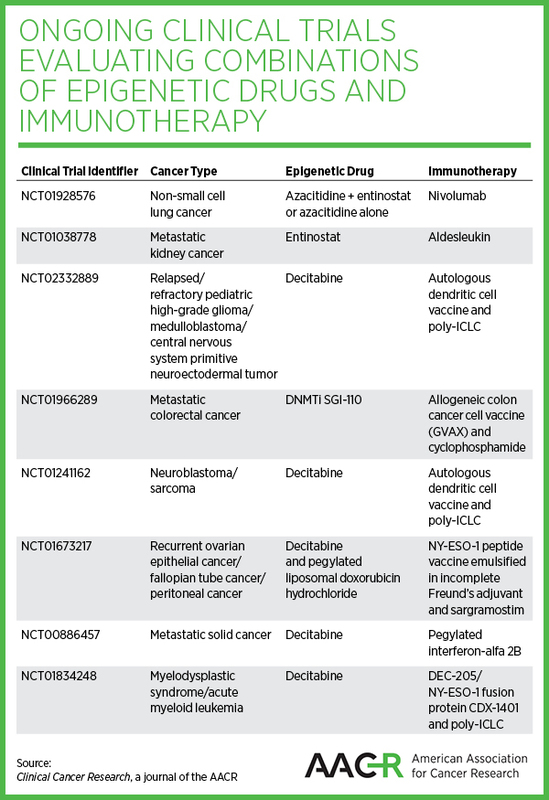 What is the prospect of combining epigenetic therapies and immunotherapy? “Like the tango, which takes two and in perfect syntony, the most successful results with cancer immunotherapies will require a perfect interaction between patients’ immune systems and their cancer cells. In light of their powerful immunomodulating potential, epigenetic drugs are seemingly the best ‘partner drugs’ to emerging immunotherapies to achieve this perfect interaction, and will most likely provide additional clinical benefit to cancer patients treated with state-of-the-art immunotherapeutic drugs,” says Michele Maio, MD, PhD, chair of medical oncology and immunotherapy, Ospedale Santa Maria alle Scotte, Istituto Toscano Tumori, in Siena, Italy. Maio and colleagues recently published a review article in the AACR’s journal Clinical Cancer Research, which provides comprehensive evidence demonstrating that epigenetic changes play a major role in shutting off the expression of certain cell-surface molecules that play a crucial role in the efficient recognition and elimination of cancer cells by the immune system. “Based on experimental evidence from our studies, we expect that epigenetic drugs could be efficiently utilized to restore the expression of these molecules, thus rendering cancer cells again ‘visible’ to the immune system to effectively eliminate them,” Maio said. In their paper, Maio and colleagues discuss the rationale behind combining epigenetic therapies with immunotherapies such as interleukin-2 therapy, adoptive T-cell transfer, and immune checkpoint inhibitors, among others. Using a mouse model, his research team demonstrated that combining epigenetic drugs, such as the DNA methyltransferase inhibitors (DNMTi) 5-aza-2′-deoxycytidine and guadecitabine, with immunomodulating antibodies that target CTLA-4 or the PD-1/PDL-1 immune checkpoint improves the therapeutic efficacy of each drug utilized alone. 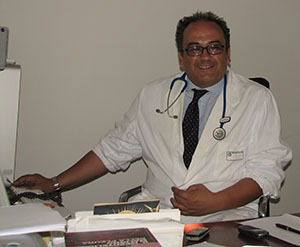 Based on this experimental evidence, they have designed a phase Ib clinical trial in which the epigenetic therapy guadecitabine and the anti-CTLA-4 immunomodulating monoclonal antibody ipilimumab will be given in sequence as first-line or second-line therapy to metastatic melanoma patients, according to Maio. The paper also provides a comprehensive overview of all ongoing clinical trials that are evaluating combinations of epigenetic drugs and immunotherapy against many cancer types, including leukemias, metastatic melanoma, metastatic kidney cancer, peripheral neuroectodermal tumors, non-small cell lung cancer, and metastatic colorectal cancer. Though in its infancy, actively testing combinations of epigenetic drugs and immunotherapy will hopefully provide cancer patients with more options that bring effective and long-lasting treatment outcomes, the authors note.